Gracilisuchus — slender, long (one) [L. gracilis = slender; Gk. sυchnós (via irregular derivation) = long] is an extinct genus of tiny (30 cm long) pseudosuchian (a group which includes the ancestors of crocodilians) from the Middle Triassic. It is placed in the clade Suchia, close to the ancestry of crocodylomorphs. Gracilisuchus was thought to be a dinosaur, but this hypothesis has since been rejected. Its fossils were first discovered in the 1970s. Many features in the hindlimbs of Gracilisuchus are also found in a group of primitive crocodylomorphs called sphenosuchians. Sphenosuchians are usually considered a paraphyletic chain of successively primitive crocodylomorphs, but the features they share in common with Gracilisuchus suggest Sphenosuchia and Gracilisuchus may form a monophyletic grouping, or valid clade, of crocodylomorphs. 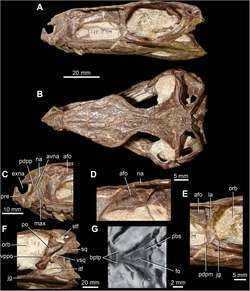 A recent paper places the genus in the new family Gracilisuchidae, along with the genera Turfanosuchus and Yonghesuchus near the base of the Suchia. 1 2 Butler, R. J.; Sullivan, C.; Ezcurra, M. N. D.; Liu, J.; Lecuona, A.; Sookias, R. B. (2014). "New clade of enigmatic early archosaurs yields insights into early pseudosuchian phylogeny and the biogeography of the archosaur radiation". BMC Evolutionary Biology. 14 (1): 128. doi:10.1186/1471-2148-14-128. PMC 4061117 . PMID 24916124. ↑ Lecuona, A.; Desojo, J.B. (2011). "Hind limb osteology of Gracilisuchus stipanicicorum (Archosauria: Pseudosuchia)". Earth and Environmental Science Transactions of the Royal Society of Edinburgh. 102 (2): 105–128. doi:10.1017/s1755691011000181. Romer, A.S. (1972). "The Chañares (Argentina) Triassic reptile fauna. An early ornithosuchid pseudosuchian, Gracilisuchus stipanicicorum, gen. et sp. nov." Breviora 389:1-24.